Super Savings Item! Free Shipping Included! 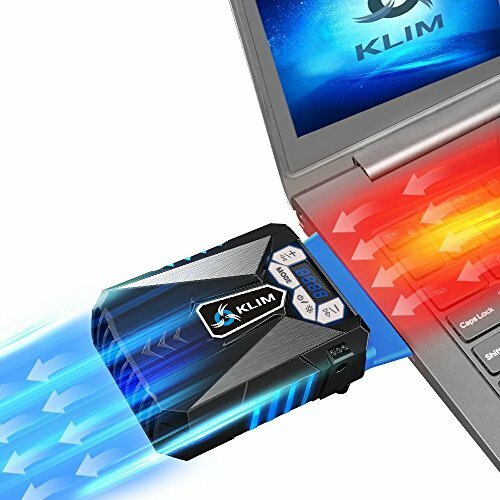 Save 34% on the ⭐️Klim Cool Laptop Cooler Fan - Innovative Portable Cooling Design with Display - External Gaming Cooler - High Performance Ventilation - USB Connection - Cooling Pad - Quiet Air Vaccum - Reduce Heat by KLIM Technologies at Pacs BG. MPN: k29. Hurry! Limited time offer. Offer valid only while supplies last. ✅ BONUS : Receive a free copy of the eBook: 7 tips to keep your computer alive and maximise its performance by email after your purchase. ✅ BONUS : Receive a free copy of the eBook: 7 tips to keep your computer alive and maximise its performance by email after your purchase. KLIM Cool is KLIM Technologies' first product. KLIM Cool is currently the most effective cooler on the market, allowing for an average temperature drop of 17.6°. This temperature drop makes the difference between a laptop PC with frequent performance issues and a laptop computer running at peak performance. It can also make the difference between a laptop PC needing to be thrown away after 3 years or one which will last you several years longer. Amazon's 30 days returns policy allows for a full refund without any return costs. Our 5 year warranty. 5 years is an extraordinary warranty time for electronics, it's our way of committing to our customers. We count on our customers' loyalty and we will do our utmost to solve any problem you may encounter. You will receive a user manual in English enclosed in the parcel + by email. ✅ AN INVESTMENT. This cooling pad is an investment => no component overheating => maximises the life expectancy of your PC and boosts its performances. ✅ Innovative patented design, our lightweight cooler targets the heart of the overheating problem by sucking in and evacuating hot air. The KLIM Cool is equipped with an anti-noise foam, making the fan rather silent. It will rarely be louder than the noise produced by the laptop itself. ✅ KLIM Cool is the first smart vacuum fan. It measures the laptop's temperature and automatically adjusts the fan's power to cool the laptop. ✅ LED screen showcasing the internal temperature and the fan's speed, which are both manually adjustable. ✅ High performance laptop cooler to be placed against the air outlet (on the side or behind the laptop). Adjustable silicone sleeves to fit all sizes of laptop (10" to 17"). Especially suited for gamers, graphic designers and video makers.